Aviation Updates Philippines - The Philippines' leading airline, Cebu Pacific (PSE: CEB), strengthens its domestic route network with four new routes to and from its Clark and Cebu hubs. The routes are geared towards making inter-island travel more accessible to residents outside Metro Manila. NEW CONNECTIONS. Cebgo will launch new domestic routes this May. Photo by ATR. Starting May 15, 2017, CEB's wholly owned subsidiary, Cebgo, will be flying daily between Clark and Caticlan (Boracay); three times weekly (Monday, Wednesday, and Friday) between Clark and Busuanga; and three times weekly (Monday, Wednesday, and Friday) between Cebu and Busuanga. Cebgo will also begin flying between Cebu and Cotabato four times weekly (Tuesday, Thursday, Saturday, and Sunday) on May 16, 2017. "We believe that by opening these new routes, we are enabling more residents from Central and even North Luzon to travel to Palawan and Boracay—two of the world's best islands, without having to make the trip to Metro Manila to catch their flights. Even guests from the Visayas who would like to explore Northern Palawan have to fly via Manila to get there. With a direct Cebu-Busuanga route, the islands of Coron and Culion are easier to get to. Aside from boosting domestic tourism, our new routes will also enhance trade and investment as we also make available our cargo services," said Alexander Lao, Cebgo President and CEO. CEB is launching the four flights with an introductory, all-in seat sale of PHP599 from April 6 to April 9, 2017, or until seats last. Travel period is from May 15 to November 30, 2017. "CEB has remained true to its commitment of making air travel safe, affordable, reliable, and fun-filled for everyjuan. Rest assured, we will continue expanding our network to enable even more of our kababayans to travel with our trademark lowest fares, not only within the Philippines, but also to international destinations," added Lao. 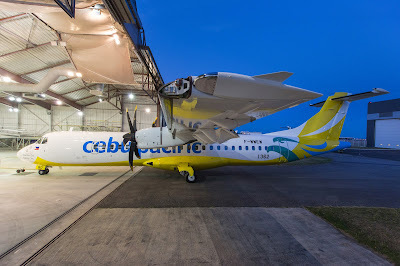 Aside from Cebu and Clark, CEB also operates flights out of four other strategically placed hubs in the Philippines: Manila, Davao, Kalibo, and Iloilo. The airline's extensive network covers over 100 routes and 66 destinations, spanning Asia, Australia, the Middle East, and USA.